This page gives information about Kenya sports - football, long-distance running, and sports options for tourists such as hiking, diving, deep-sea fishing and dhow sailing. Football (soccer in the US) is no doubt the most popular sport in Kenya. People are nuts about it. It was introduced by the British in the early 20th century. While tribe is generally important in Kenya, football remarkably crosses both ethnic and class lines. Streets are empty during the World Cup, when millions are in front of the TV. A quick way to make friends with a Kenyan male is to simply mention some famous Kenyan football players from your own country. The national team is popularly known as the Harambee Stars. It consists of the best players from other football teams in Kenya. Other popular football teams are the AFC Leopards, Mathare United from Mathare Valley, and the Coast Stars from Mombasa. Several companies also have their own football teams, such as Mumias (a sugar company), Tusker (the national beer brand) and Kisumu Telkom (a phone company). But British teams such as Arsenal and Manchester United are also fanatically supported. Kenyan football has even been internationalized. In 2000, German coach Reinhard Fabisch was hired to bring the national football team to a higher level. 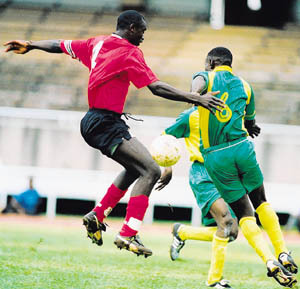 In 2001, several Kenyan football players went to top European football teams. Paul Oyuga was transferred to a club in Sweden and Robert Mambo and John Muiri moved to Belgium. Many big football matches take place at the Moi International Sports Center on the outskirts of Nairobi, whose official capacity is 60,000, but which hosts many more during national matches. Tickets for games are usually between KSH 300 and KSH 600 (about $4 to $8) and matches are quite an experience. Check out the Daily Nation newspaper for important games. 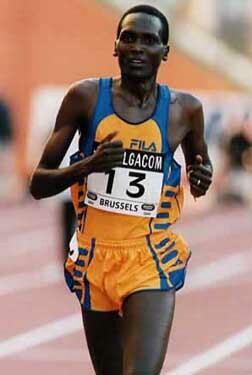 However, the sport in which Kenyans are world-leaders is long-distance running. During the Sydney Olympics of 2000, Kenyans won the Olympic gold medal in the 3,000 meter steeplechase – a combination of hurdling, going through water and running, for the 7th time in a row. Between 1964 and 2000, Kenyans have always won this event, if we don’t count the two Olympic Games they boycotted. No-one can deny Kenyan superiority in this discipline – runners from Kenya alone account for over 90 of the 100 best times in steeplechase ever. But they also lead in other long-distance events. John Manners, a Kenyan-born journalist, calculated in his book “The Running Tribe” that across all the distances from 800 to 10,000 metres, Kenyans have won about 50% of all the Olympic and World Championship medals for men - while Kenyans only account for 0.5% of the world population. Even more remarkably, within Kenya one tribe – the Kalinjin – can claim about 75% of all Kenyan medals. Men from this tribe account for about 10% of the Kenyan population and only 0.05% of the world population, yet the Kalinjin win close to 40% of ALL international long-distance running prizes for men. The East African Safari Rally has been held annually since 1953, from November to December. It’s a rugged 3,000 kilometer car rally passing through Uganda, Tanzania and Kenya along public roads. It attracts an international group of drivers with their vintage (pre-1974) cars, as these are the only ones allowed. It’s a spectacle well worth watching if you are there. In Kenya sports options for tourists are plenty avaible. Hiking is a popular choice in the mountain areas. Guided tours are often available. Walking safaris are also an option. But never try this without a guide. Wild animals are dangerous and can kill humans – elephants and especially hippos have probably killed more people than lions. And regarding crime: while Kenya is in general a safe country as long as you are among people, it’s not usually safe to walk alone in deserted areas. Next to the Central Highlands and the Rift Valley, golf is played a lot in the Nairobi area, which has 6 eighteen-hole courses. Cricket received a boost when Kenya beat the West Indies in at the World Cup in 1986 and became third overall in 1993. Most matches are played in the Nairobi area. Have a look at my seperate page about the Kenya national cricket team, which has achieved remarkable international successes recently. In the coastal areas, there’s a range of water sports. You can rent snorkeling gear at most of the beach resorts and hotels. Diving is possible around Mombasa, which has beautiful sea reefs. The season runs from April to October. Fishing is also popular along the coast. Deep sea sport fishing can be done with guides who can be hired for a day trip. In many coastal places it’s also possible to hire a dhow with a crew for day trips.